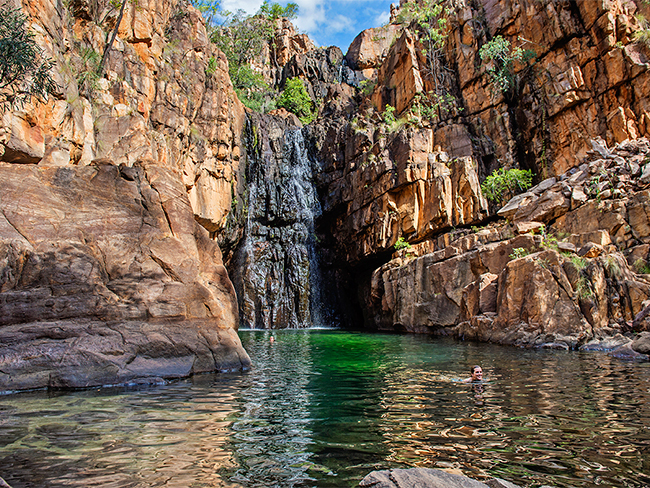 You'll be drawn to the majestic beauty and sheer size of the spectacular Nitmiluk Gorge. 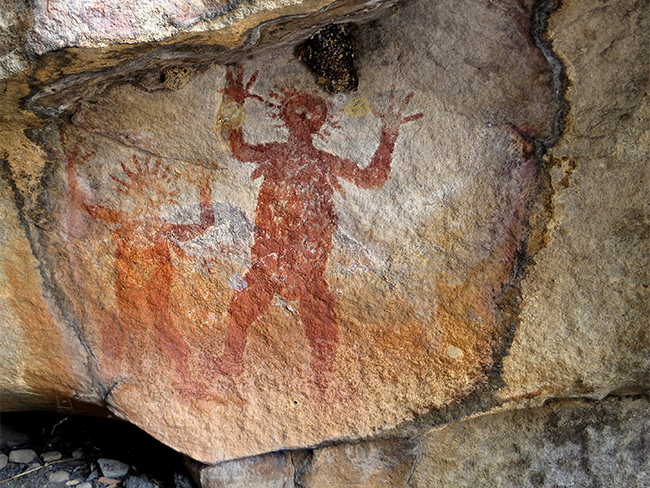 Located on the lands of the Jawoyn people, rock art sites dot the park and dreaming stories bring the silent gorge walls to life. You can learn about the Jawoyn people's association with the land at the Nitmiluk Centre or by taking a boat cruise of the first few gorges. Take sunrise or sunset cruises and see the gorge turn all shades of mauve and red. There are canoes for hire or you can get a permit to use your own canoe from the Nitmiluk National Park Visitor Centre. You can canoe to the fourth, sixth and ninth gorges and camp overnight, but make sure you book ahead of time by calling Nitmiluk Tours on (08) 8972 1253 or 1300 146 743. You can use fishing lures in areas of the Katherine River, but fishing is not permitted in Edith Falls. Walkers have plenty of trails to choose from and waterfalls to see, but the ultimate trek is the 62km Jatbula Trail. 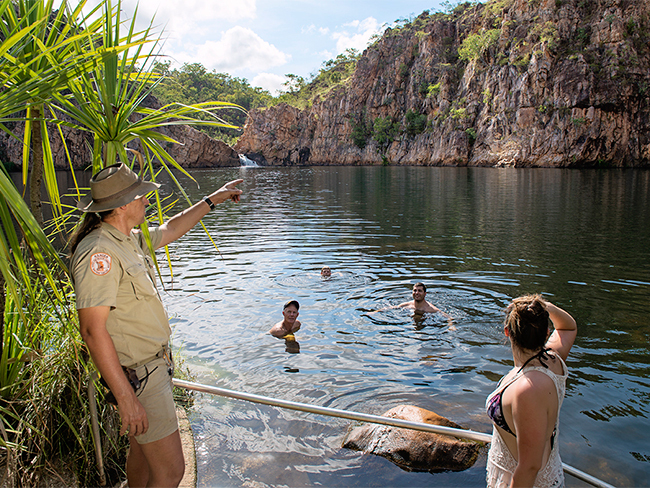 To fully experience Nitmiluk Gorge, take a helicopter ride and get set down for a swim in one of the harder to reach gorges. Get the Nitmiluk National Park fact sheet and map (751.4 kb). Boat tours Open 1st and 2nd gorge tours. Please contact Nitmiluk Tours for boat tours on 1300 146 743 or visit http://www.nitmiluktours.com.au/. All year round, but the park and some activities may close due to flooding in the Wet Season. The best time to visit is between May and September. Nitmiluk Visitor Centre is open daily from 8am to 5pm. The Gorge entrance to the park is 30km east of Katherine on the sealed Gorge Road. Follow the signs. The turnoff to Leliyn (Edith Falls) is 40km north of Katherine along the Stuart Highway. The park entry is 20km further along Edith Falls Road. A visit to Leliyn (Edith Falls) in the west of the park should also be on your list. Swimming in the lower and upper pools is a must. If you have time for a full day or overnight walk, go for a swim in the secluded Sweetwater pool. You need a permit for the overnight walk to Sweetwater pool so book early by using the contact listed for Leliyn below. Get the Leliyn (Edith Falls) fact sheet and map (1.2 mb). Powered and non-powered sites are available near the Gorge Caravan Park. Camping fees apply and are payable on-site. You need to book overnight accommodation and canoeing at the Nitmiluk Gorge sector. Call (08) 8971 0877. Non-powered sites are available at Leliyn (Edith Falls). For more information contact the Leliyn kiosk on (08) 8972 2884. Leliyn (Edith Falls) does not take bookings, but the best time to arrive to secure a spot is 10am, as this is when campers who are not staying another day have to vacate their site. you are not able to use a private powered vessel in the Katherine gorge system from 1 June to 31 August. At other times you can use a private vessel in the first gorge, except when the river is closed due to Wet Season flooding. You can fish only with lures - bait cannot be used, to avoid accidental capture of turtles. Nitmiluk Tours provides a variety of accommodation at the gorge sector. Call 1300 146 743.
check your vehicle is not transporting pests like weeds and cane toads. carry a personal locator beacon on long walks.